Artificial intelligence (AI) may be Elon Musk’s bane, but the European Space Agency (ESA) is putting it onboard the International Space Station (ISS) for a series of experiments later this year. IBM Watson and Airbus have put together a floating AI-assistant scheduled to be transported up to the station later this week. CIMON — Crew Interactive MObile CompanioN — combines a user interface “terminal” the size of a medicine ball and weighing in at 5 kilograms with backend processing from IBM’s cloud running Watson. The CIMON technology demonstrator will be tested onboard ISS by ESA Astronaut Alexander Gerst between June and October 2018. Airbus created CIMON’s plastic and metal body using 3D printing. The AI application is designed to support astronauts in performing routing work by displaying procedures and offering solutions to problems as it learns more from onboard interactions. CIMON is anticipated to make work easier for crew when carrying out routine tasks, help to increase efficiency and improve safety and security as it can serve as an early warning system for technical problems. 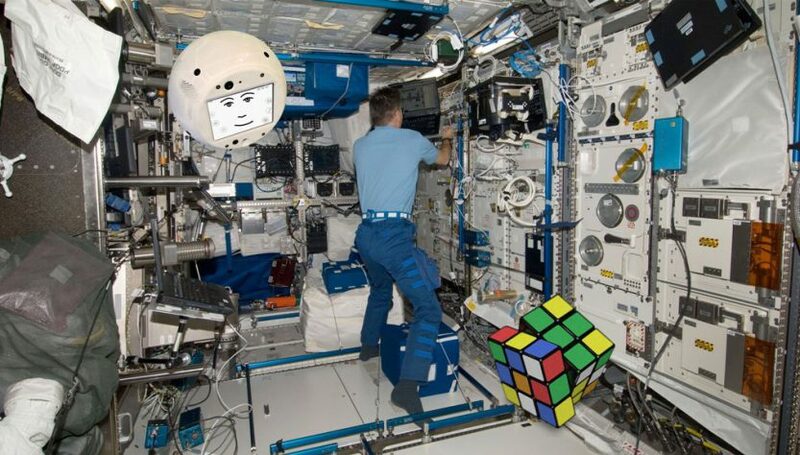 CIMON’s Watson AI has been trained with voice samples and photos of Gerst, along with loading up plans and procedures of the ESA Columbus model of the space station. Gerst also selected CIMON’s screen face and voice. Once the basic testing of the AI system has been, Gerst will interact with CIMON three times to assist with a crystals experiment, solve a Rubik’s cube, and perform a complex medical experiment with the flying ball acting as an intelligent flying camera. Future interactions will examine human/AI interactions applicable to both future long-term missions to the Moon or Mars as well as more ground-based uses in hospitals and social care. The CIMON demonstration is a part of roughly 3,300 kilograms of total cargo scheduled to be launched on the morning of June 29 onboard the SpaceX CRS-15 commercial resupply service mission. Also onboard will be several imaging sensors for installation on the station and the third run of the Made in Space ZBLAN optical fiber optical production. High-quality, low loss ZBLAN optical fiber is a promising product for space manufacturing profits.